10 colors of lead core line spooled on. Sometimes it’s not high technology that catches fish, but rather “old school” tactics that put them in the box. Modern lead core fishing lines hit the market right after WWII when the new at the time magic fabric Nylon was first introduced. Essentially, lead core line consists of a thin lead wire covered with a coating of braided nylon to give the line strength. Like other fishing lines lead core is rated using a “break strength” notification and the most common sizes are 12, 15, 18, 27, 36 and 45 pound test lines. Interestingly enough all of these line sizes do not have their own unique lead wire. The size 12 and 15 share one wire size, as does the 18 and 27 and the 36 and 45 pound test lines. In other words, there are three different diameters of lead wire used to manufacture all six common sizes of lead core line. Obviously lead core is a “sinking” style fishing line that helps take lures to greater depths than they would fish on normal line types. Getting deeper with the help of lead core is a big part of what fishing sinking lines is all about, the benefits of lead core go much deeper.... no pun intended. Before we talk about the other benefits of lead core, it’s important to note that a number of manufacturers are producing lead core lines using Spectra Braids for the exterior coating and also a similar fiber known as Microdyneema. Both of these high tech fibers are thinner and much stronger than nylon, allowing modern lead core lines to be thinner in diameter and also deeper fishing than the traditional lead core lines made using nylon braid. How much deeper these modern lead core lines fish is subject to opinion and manufacture biased propaganda. Some manufacturers are claiming that their lead core lines fish up to 30% deeper than traditional lead core lines. Precision Trolling Data took a in-depth look at these new lead core lines and concluded that they indeed run deeper, but on average the increase is closer to 20%. Most anglers who fish lead core line favor “segmented” rigs that consist of 25-50 feet of fluorocarbon leader, a pre-determined amount of lead core line and finished with an adequate amount of monofilament or braid backing line. 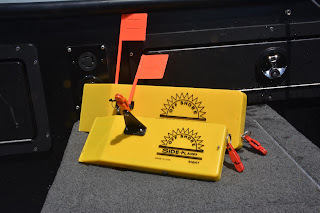 Anglers commonly set up segmented rigs in pairs, for example a pair of “one color” set ups, a pair of “two color” set ups, etc. Segmented lead core rigs are commonly fished in combination with in-line boards like the famous Off Shore Tackle OR12 Side-Planer. The angler simply puts his lure of choice on the terminal end, lets out all the leader and all the lead core line, then attaches the board to the backing line and sends the whole set up out to the side. lengths of lead core line sandwiched between a leader and backing line. to stagger lines and cover the maximum amount of water. To enable anglers to fish multiple “segmented” lead core rigs at one time shorter segments are fished on the outside lines and longer and deeper running segments are fished on inside lines. Rigged in this manner a fish can be hooked on the outside board and reeled in over top of deeper running inside lines without having to clear any lines. The best way to set up multiple board rigs fishing segmented lead core is to fish set ups that cover the water column throughly. For example, a common set up would be to run a three color on the outside, a five color on the middle board and a seven color on the inside board. This effectively saturates the water column with lures and separates the lure depths enough that pulling one line “over top” of another poses no tangle issues. Depth is obviously a critical advantage of fishing lead core line, but there are some other equally important features of lead core line worth examining. Because lead core has little or no stretch, the hook up ratio when fishing these lines is exceptionally good. 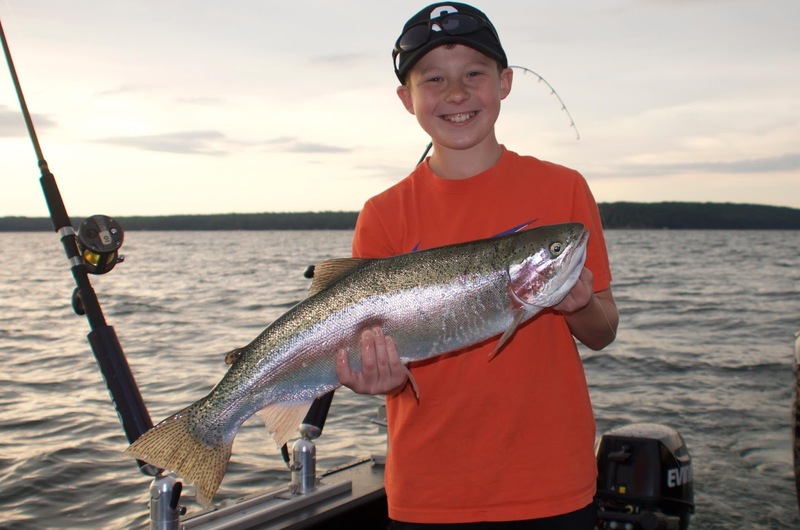 To compensate for the low stretch in lead core, most knowledgeable anglers compensate by fishing longer rods or softer action rods that build in a little cushion for fighting and landing fish. When trolling with traditional lines like monofilament, most of the lead length is floating at or near the surface. Only the line closest to the lure is actually pulled below the surface. This creates a distinctive “bow” in the line which is counter productive to achieving quick and positive hook ups while trolling. Essentially the fish grabs the bait and must hang on for several seconds until the bow in the line is pulled taunt. During these critical seconds a fish can easily decide to drop the bait and swim off unharmed. Lead core line helps to reduce this “time lag” associated with traditional lines because the bow in the line is reduced when fishing lead core. 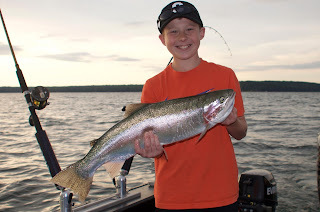 Because the weight of lead core is evenly distributed throughout the line, lead core runs in more direct path to the lure, reducing the bow in the line and enabling a faster hook up when fish bite. Think of it this way, when a fish bites a lure fished on lead core, that fish has less time to change it’s mind and reject the lure. As a result, fishing lead core helps anglers catch a higher percentage of the fish that bite. Not all the features of lead core line are sunshine and rose petals. There is a down side to using lead core line anglers must wrestle with. Because lead core is much thicker in diameter than traditional lines, it takes larger reels to handle significant amounts of lead core line. Often the reels needed are so large they become not only expensive, but awkward to fish with. Also, to achieve any significant depth fishing with lead core line requires using very long trolling leads. Long trolling leads are not a major issue unless fishing in traffic with other boats. Because the other anglers don’t realize how far behind the boat a lead core angler is fishing, tangling lines with other fishermen becomes a constant threat. The third and equally important down side to fishing lead core line is the speed dependence issues. Lead core sinks so trolling speed influences on the fishing depth dramatically. It only takes a modest change in trolling speed to create a significant depth change. Obviously with sinking devices the slower an angler trolls the deeper the set up is going to fish. Conversely when trolling faster, set ups are not going to dive/fish as deep. In terms of lead core fishing at faster trolling speeds negates the ability for lead core to fish deep. At trolling speeds above 2.5 MPH, lead core sacrifices so much depth, fishing with it becomes questionable. catch an equal number of fish. The moral of the story is that lead core has a defined “niche” in the trolling scene. 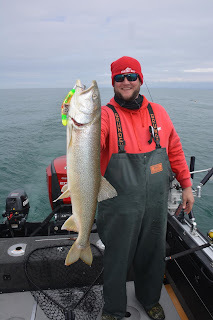 Used at slow to moderate trolling speeds, lead core is a huge aid in fishing the common depths trout, salmon, walleye and striper fishermen encounter commonly. The hook up ratios associated with trolling lead core are a clear advantage over traditional lines. Lead core set ups can easily be fished in combination with in-line planer boards making them even more versatile. A host of anglers feel these advantages more than make up for the fact fishing lead core requires setting out copious amount of line and also investing in a lot more rod and reel set ups.